There are many things that can be said about Venice, but one thing is for sure: You will hate yourself for coming here. If you find the floating city too crowded, too smelly, or too touristy, then you will hate yourself for wasting your time. If you find the colorful canals to be enchanting, the ever-flowing waterways to be life-giving, and every twist and turn of the hidden alleyways an adventure, then you will hate yourself for coming because now a piece of your heart will always be in Venice’s snare. Yes, Venice is crazy crowded. Yes, Venice is very expensive. Yes, Venice is unbelievably beautiful. Do I think you should visit Venice at least once? Yes, even if it’s only for 24 hours. Below I’ll show you where to stay, some things to do, and where to eat in Venice on a short trip. 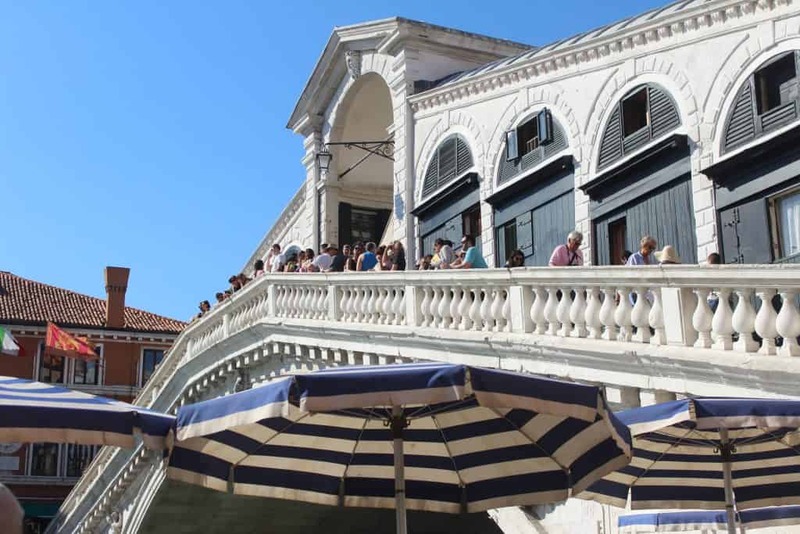 I’ll also give you a sample 24-hour Venice itinerary you can follow. *This post contains affiliate and referral links, which means I receive a commission or credits if you choose to purchase through my links, at no extra cost to you. Thanks for supporting my work! Fly into Marco Polo Airport (VCE). From there, you can take a water taxi into Venice. Or take the train to Santa Lucia Station. 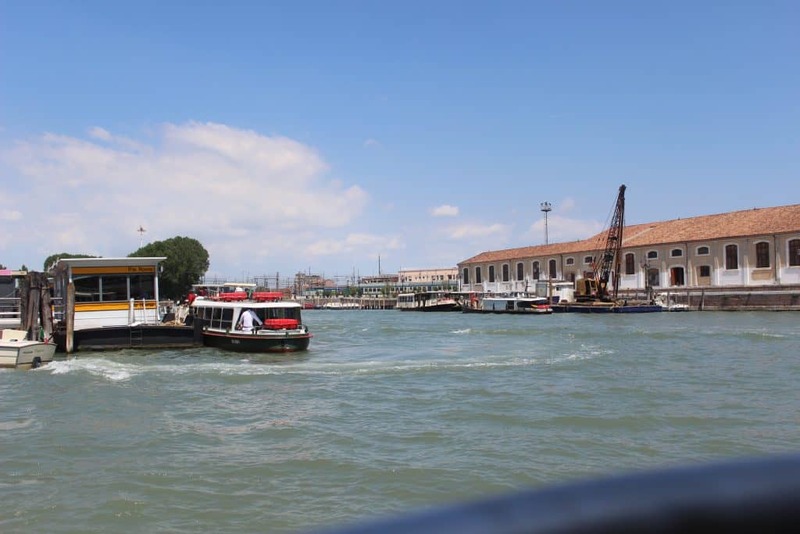 From there, you can take the vaporetto into Venice. 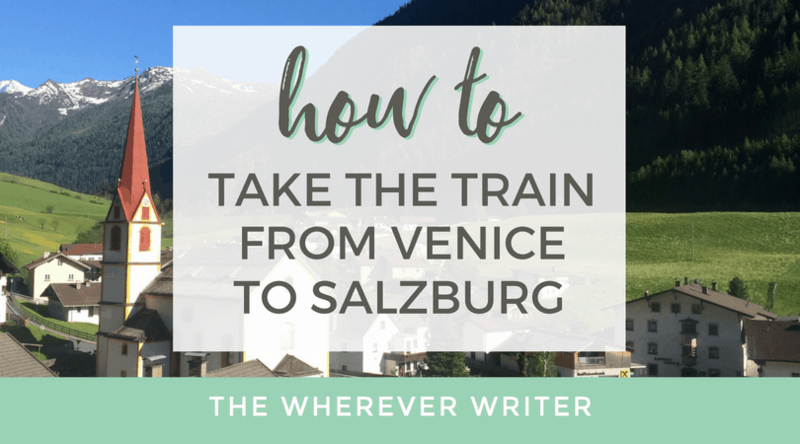 Alternatively, and what I wish I would have done, you can stay in Padua (a charming college town and known for its patron saint St. Anthony of Padua) and then take the 30-minute train ride to Santa Lucia station. This will make your lodging cheaper, since Padua has much more reasonable rates than Venice. Staying anywhere near Piazza San Marco (St. Mark’s Square) will be the most expensive option. 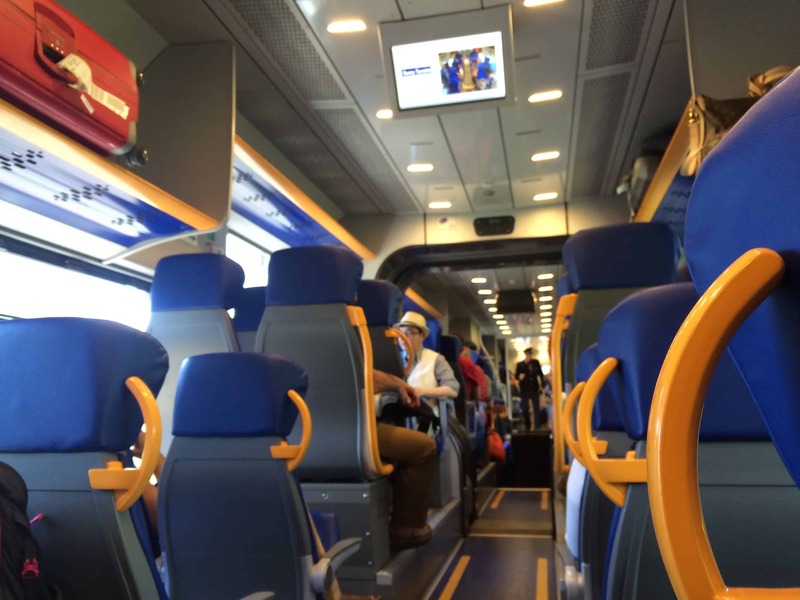 If you’re on a tight budget, your best bet is to stay off the islands, such as in Padua or in Treviso, and then take the train and vaporetto over to the islands. BUT, if you have only 24 hours in Venice, you should stay in Venice itself, as close to the attractions as possible. You don’t have time to waste in transit. In that case, I would recommend the neighborhood of San Marco. I stayed at this lovely guesthouse in Castello, walking distance to St. Mark’s Square and really every tourist sight you’d want to see. 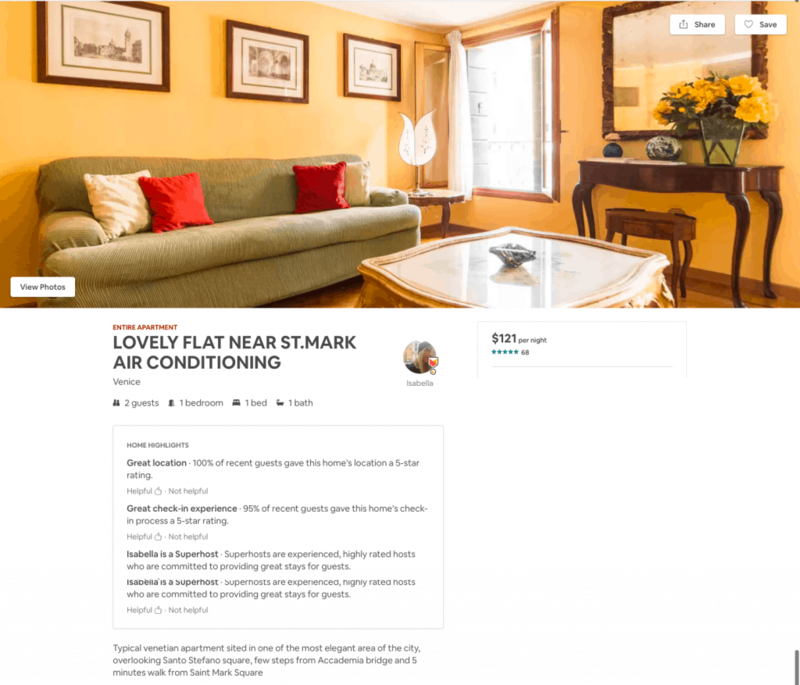 This lovely apartment is near St. Mark’s Square, has a balcony, and has AC (a must in summer!). Click here to get $40 of Airbnb travel credit! 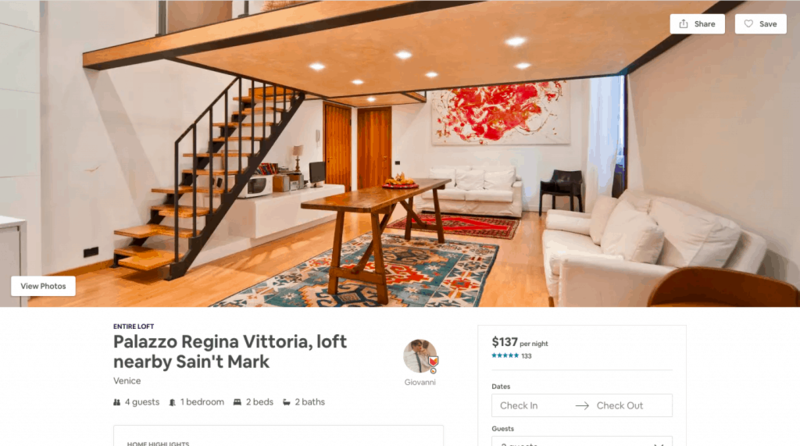 This one-bedroom loft is just 200 meters from St. Mark’s Square, has 2 beds, and can sleep up to 4 guests. 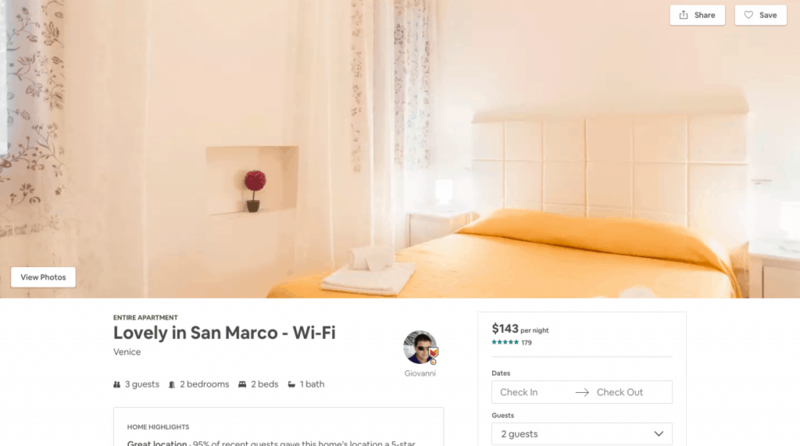 Get $40 off your first Airbnb stay here. This two-bedroom apartment sleeps up to 3 guests and has A/C for those hot summer months! Click here to get $40 to travel with Airbnb. 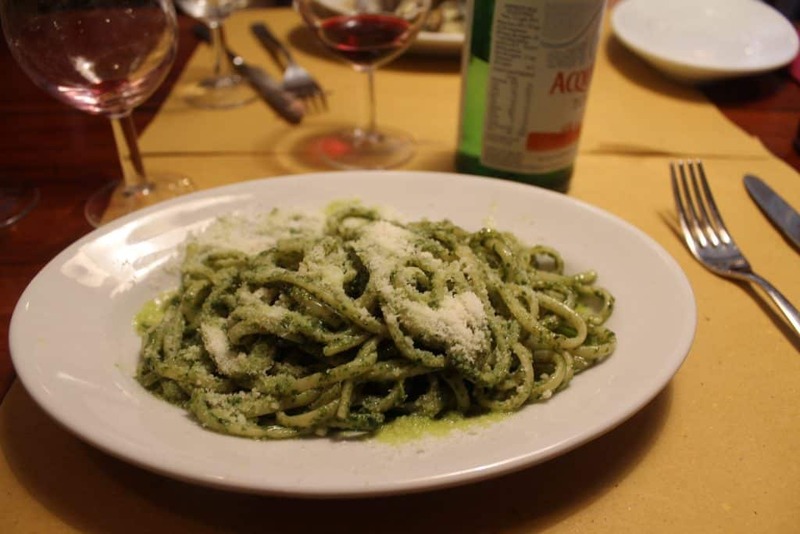 This cozy traditional Venetian restaurant is Michelin starred—and for good reason. Order the meatballs, sauteed vegetables, and a pasta dish. Then mix it all together. So. Good. They do have English menus if you don’t know Italian. Also, our waiters all spoke English. Grilled Season Vegetables. Since the Bavetta al Pesto didn’t come with veggies, I ordered some to mix into it. This place is famous for its meatballs, so definitely order some! They were tender and flavorful. 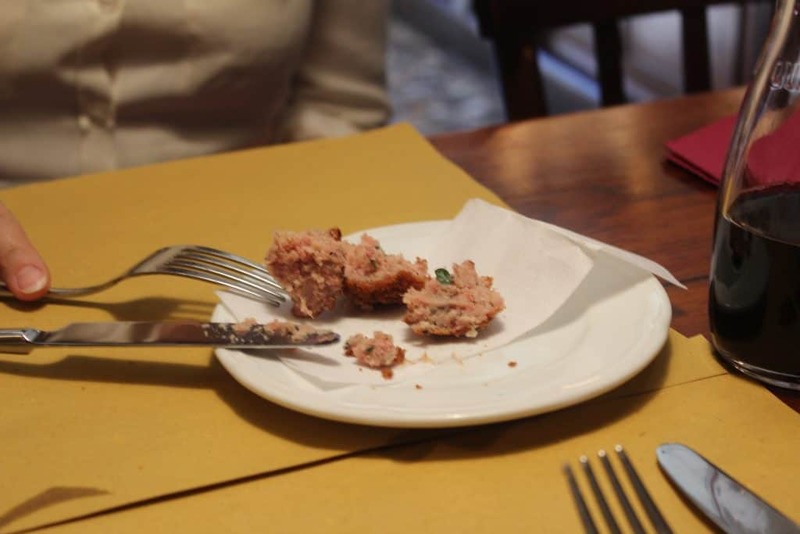 Just note that when you order a meatball, you literally get ONE meatball, so be sure to order several if you plan to share. 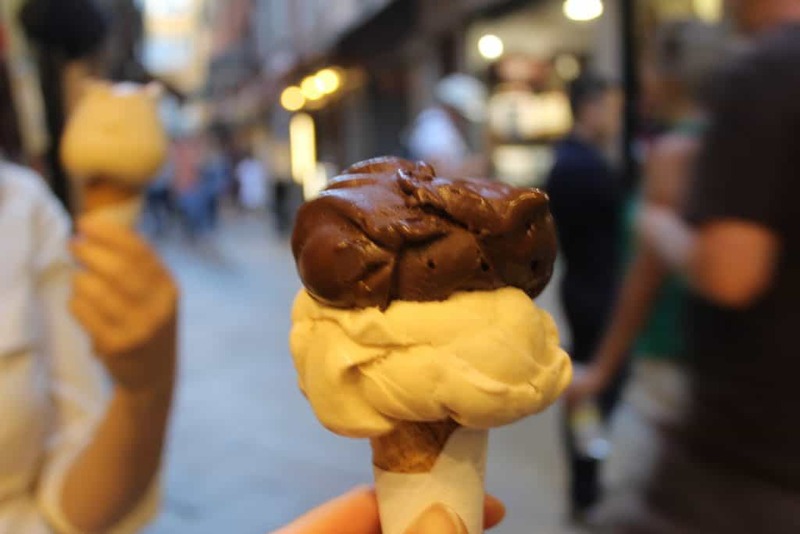 Homemade gelato! I got the chocolate and hazelnut flavors. Monday-Sunday 10 a.m. to midnight. This pizza place was always crowded, so we decided we had to see what they hype was all about. The pizza was pretty good, though I wish I had ordered their famous thin crust one! 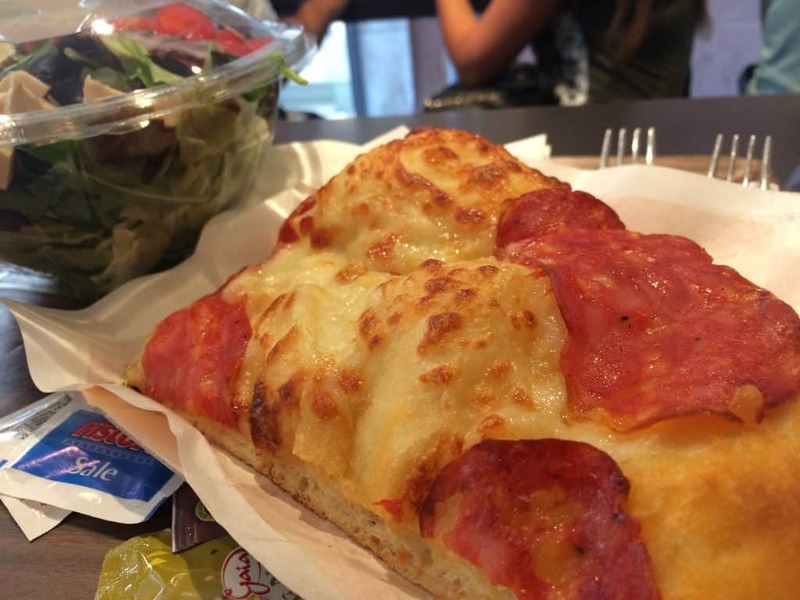 Friday-Sunday: 8 a.m. to 10 p.m.
What I ordered: Salame Piccante pizza and Romana salad. I only ordered the salad because I missed avocado and felt like being healthy, but I wouldn’t recommend it. Definitely get THIN crust pizza here! Finding seating is a battle here because it’s so popular, and it’s mostly bar seating, no private tables. It might be best to get yours to go. A table for two, please. = Un tavolo per due, per favore. The bill, please. = Il conto, per favore. That’s all. = E tutto. 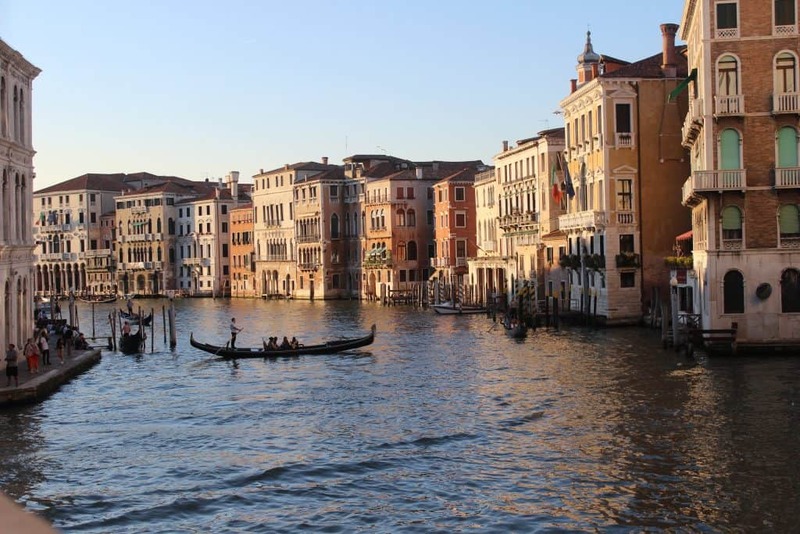 Venice is extremely walkable, but you are guaranteed to get lost multiple times on your stay. Locals walk and take the traghetto, an everyday local gondola (not the fancy ones for tourists) or vaporetto, which is a ferry shared with other passengers. You can take the vaporetto just for a joy ride, too! There are also water taxis, which cost more than vaporettos because, like regular taxis, they are private. And, yes, we must mention gondolas. These exist solely for tourists’ entertainment and involve a striped-shirt wearing man serenading you as he rows you through the canals. I didn’t end up taking one (they’re expensive! ), but if you want to try it, you should! They’re 80 to 100 Euros. 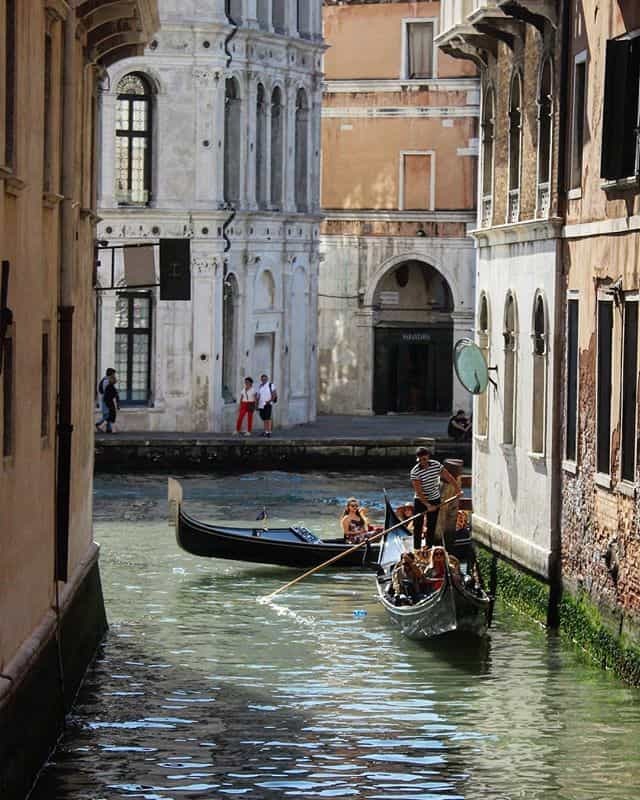 Here’s more info on taking a gondola ride in Venice. Early morning (around 5:30 a.m.): Go to St. Mark’s Square for the sunrise and photos before the crowds arrive. 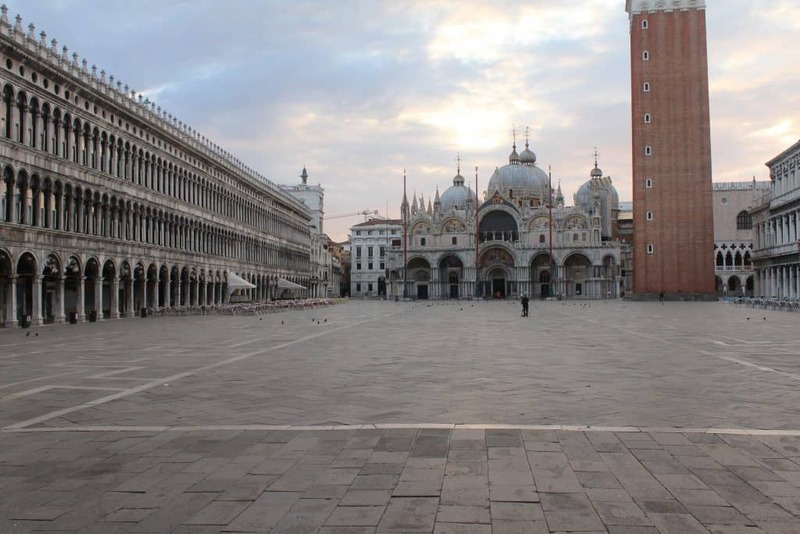 Piazza San Marco (St. Mark’s Square) at 6 a.m. You will never see it so empty! 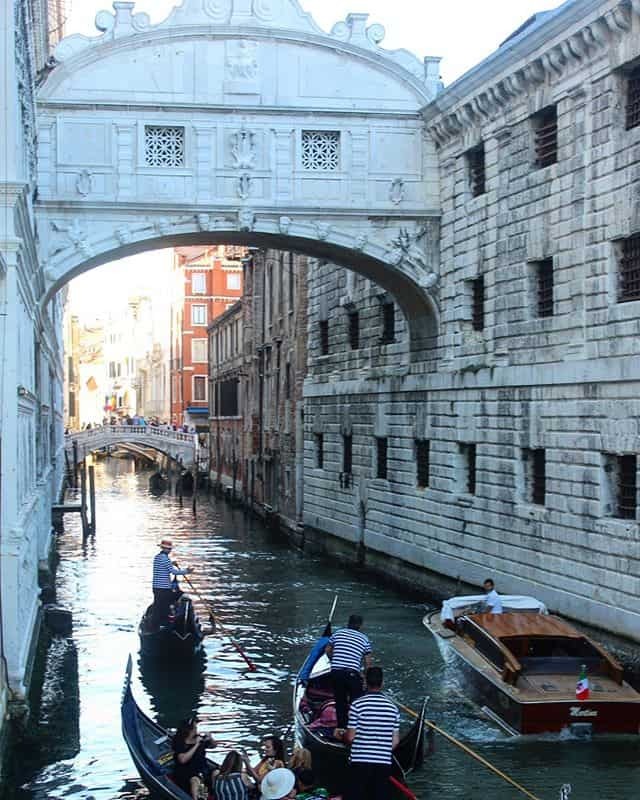 Walk to the Bridge of Sighs. The Bridge of Sighs connected the Doge’s Palace to the New Prison and is so named because of the legend that prisoners would sigh upon looking out at their last view of Venice before being taken to their cells. 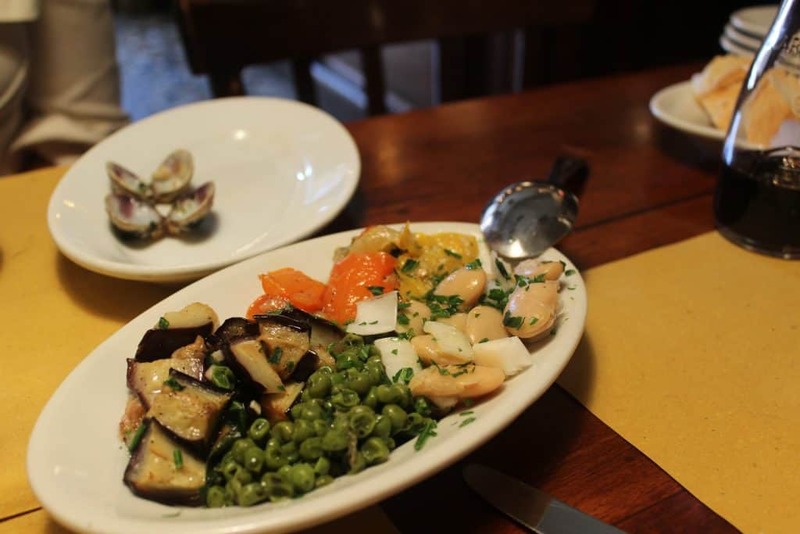 Grab breakfast at Ponte delle Paste (opens 6:30 a.m.). There are so many delectable pastries in here! There’s also coffee, which you will need if you got up so early! Rialto Bridge is nearby. This is a famous bridge, the oldest of the four bridges that cross the Grand Canal. When I was there in May, the bridge was so packed with tourists it was almost impossible to walk over it! 10:30 a.m.: Get in line to tour St. Mark’s Basilica. Okay, this is something I REALLY wish I could have done while in Venice: tour St. Mark’s Basilica when it is illuminated! I learned about this by listening to the Travel With Rick Steves podcast. Debbie from Lafayette, Louisiana, called into the show and said this to Rick: “To see the church go from dimly lit to brilliantly lit was an experience. It was a religious experience. We’re not Roman Catholic but to see everything including the skin on our arms reflect gold was just incredible.” Click here and fast forward to 28:18 to hear the pure emotion in her voice. It gave me goosebumps just hearing her describe it! So when does St. Mark’s Basilica light up? 11:30 a.m. to 12:45 p.m. on weekdays and during liturgical celebrations on Sundays and holidays. Sundays and holidays: 2 p.m. to 5 p.m. Admission cost: It’s free to enter the Basilica (church). There are fees are for the bell tower, museum, Pala d’oro, and treasury. Click here to skip the line at St. Mark’s Basilica! Grab a slice of thin crust pizza and fight for a seat at this trendy pizzeria. Otherwise, get your food to go and stroll along the canals while you munch. 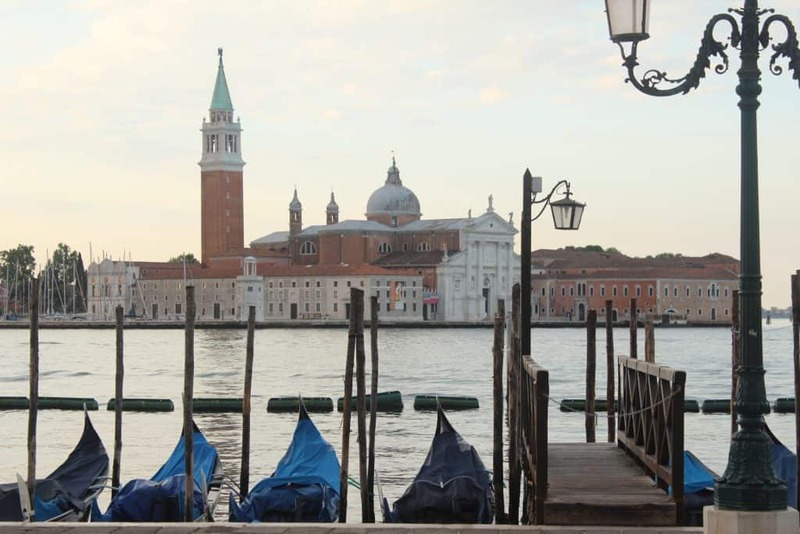 Enjoy the spectacular views from the San Giorgio Maggiore bell tower. While many flock to the bell tower in St. Mark’s Square, the bell tower of San Giorgio Maggiore has a more spectacular view of the main island in Venice. It also is free to enter and, unlike the bell tower in St. Mark’s Square, this one has an elevator so you don’t need to climb any steps! Go on a gondola ride or take a joy ride on a vaporetto (much cheaper). If you want, you can take a gondola ride, but they are 80 to 100 Euros. If you’re on a budget, opt for a vaporetto joy ride across the canals! Alternatively, you can cut down the cost of a gondola ride by sharing it with other passengers. Every tour guide will tell you that Venice is a place to just stroll and get lost. Let me tell ya something: You will get lost whether you want to or not! It can be really frustrating because even when using Google Maps, what seems like a straight shot to a place actually takes many twists and turns because of the numerous canals and alleyways. And yes, while it’s beautiful to get lost in Venice, if you have only 24 hours in Venice, you don’t have time to get lost! So go for a leisurely stroll but don’t lose track of where you are. Eat dinner at Trattoria Ca’ d’oro-Alla Vedova. Watch the sunset over the Grand Canal. This was another favorite thing I did. My friends and I simply walked to a stretch of the Grand Canal and sat along its edge as the sunset. The colors played upon the water like a painting. It was super romantic! Listen to the dueling orchestras in St. Mark’s Square. At night, you can hear/see the orchestras from anywhere within St. Mark’s Square, but technically, you’re supposed to purchase something so you can sit at a cafe. This comes with a hefty price tag, though, so I totally understand if you don’t want to do that. You can just stroll around the square and listen to the classical music floating from every corner. Enjoy Your 24 Hours in Venice! Even with only 24 hours in Venice, I truly believe it’s worth the visit. You will walk away sighing, and with a memory card filled to the brim with images. You can’t take a bad photo in Venice; it’s impossible. Every turn presents a new sight you’ll want to capture. And when you leave, you’ll definitely want to come back. Want more Europe info? 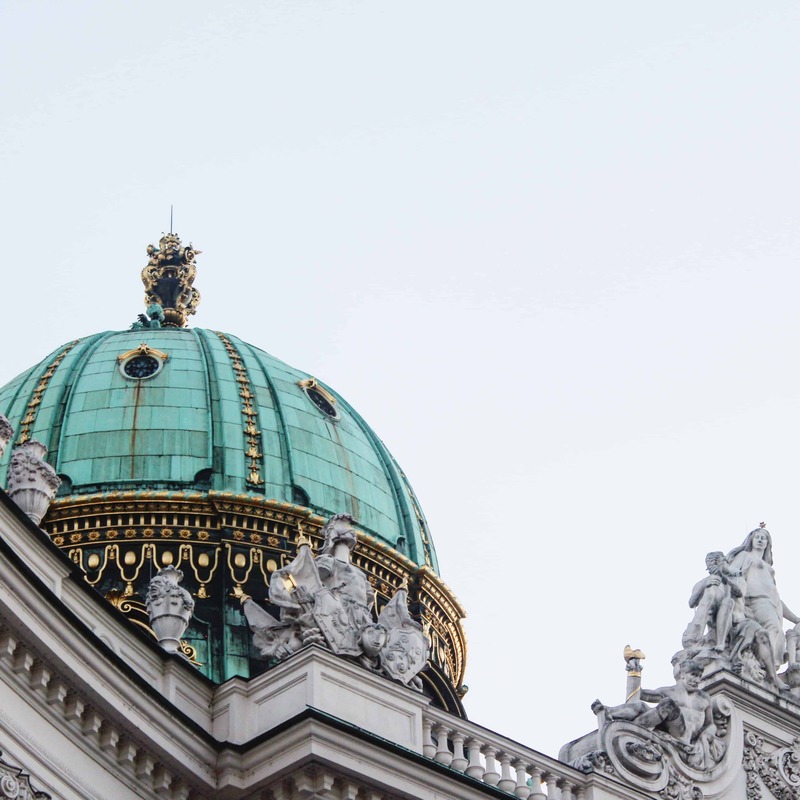 Take a look at my complete 2-week Europe itinerary. Was this post helpful? Pin it to Pinterest!